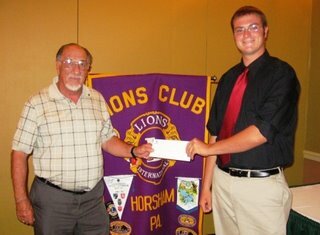 In July 2006, the Horsham Lions Club presented $1,000 scholarships to three seniors, and $2,000 to one senior from the Hatboro Horsham High School, totaling $5,000 in scholarships. The club strives to present several scholarships to local students each year, in an effort to assist in furthering the education of community-minded young adults. The students were chosen anonymously, and the choice was made not only on academic merit, but on the level of community and humanitarian involvement the students displayed. 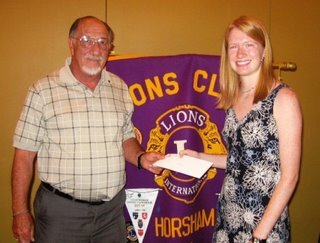 Since beginning the scholarship program, the Horsham Lions Club has presented more than $130,000 in scholarship money to local students. Bruce McCaffrey (below) will be attending Drexel University this fall, studying Civil Engineering. He’s participated in many extra curricular activities, as well as being employed as an apprentice at McCaffrey Fuel Oil for many years. He’s acquired a wide range of skills, including welding, plumbing, and HVAC systems. Bruce is also a volunteer for our local fire company. He also has been involved in Boy Scouts for many years, and is currently an Eagle Scout, the highest rank that a Boy Scout can achieve. Bruce is the second child in the McCaffrey family to have received a scholarship from the Horsham Lions. Sarah Klein (below) will be attending Messiah College this fall, studying German Education and Music Education. She was involved in band and SADD (Students Against Destructive Decisions). Sarah has been highly active in Girl Scouts for many years, and has been an assistant to club president Andy Weiss’s wife (Suzanne), who leads two Girl Scout troops. Jennifer O’Neill (below) will be attending Penn State this fall, studying Business Administration. She is very active in Track, Student Council, and many other high school committees. Her community service includes Habitat for Humanity, Toys for Tots, Special Olympics, Make-A-Wish Foundation, and Breakfast with Santa, along with several other ventures. She’s spending the summer in Europe visiting many countries. Chelsea Pessolano (below) will be attending Albright college this fall, her major has yet to be declared. She’s been active in the Student Advisory Board as well as the Interact and Key Clubs, and Youth Leadership. She’s been cheerleading throughout high school. She was sent to a Leadership Skills camp by the Horsham Rotary. Chelsea also participated in the Big Brothers and Sisters organization, as well as volunteering for Horsham Day and Habitat for Humanity. Mr. McCaffrey received the sole $2,000 scholarship, which was named in memory of Max Hankin, longtime Horsham entrepreneur and participant in the Lions Club. His widow Janet still helps the Lions in our cause by permitting use of her property to park cars during air shows. Without Mrs. Hankin's support, and the hard work of our members during fundraisers, scholarships such as these would not be possible. Please join us in congratulating these students and encouraging their continued growth! Pictured seated is Amber DeBonza. Pictured standing (L to R) is Christen Egan, Sharon Damsker, and Ed Corbeil We were contacted very recently by Sharon Damsker, director of community relations for Sunrise Assisted Living in Dresher. Their new facility has opened recently, and is starting to accept new residents. The Sunrise home in Dresher is pioneering a new program, named Bradford View. These assisted living apartments are customized for seniors with low vision. Great detail has been given to the choice of fabrics, colors, layout, and design of these apartments, so that residents with low vision can enjoy a better quality of life. Staff and care managers are specially trained to assist residents with low vision. Activities are also tailored to meet these residents’ special needs. Vision specialists were consulted to make this program unique and beneficial. Sharon and her team would like to make this new program known to the community, and chose to help spread the message by contacting the Horsham Lions club. In addition, being an organization which strives to encourage and support service organizations such as the Lions, Sunrise has several partnership ideas which we are going to be working on together. (1) Sunrise is going to be placing eyeglass collection boxes in all of their facilities in this region. There are currently 14 of these homes, and more are on the way. The eyeglasses will be collected and donated to the Lions Club in each home’s region. We will help put them in contact with the proper clubs. (2) Sunrise of Dresher held a fundraiser for the Lions Club on August 24th at the Garden Golf center on Upper State Road in North Wales. Sunrise did this to increase exposure for the Lions, as well as increasing awareness of their new low-vision apartments. We got to meet and speak with Sharon and other Sunrise staff, and learned quite a bit about the Bradford View program. In addition, Sunrise donated 50 pair of eyeglasses to our club. (3) Sunrise will be hosting one of our meetings in the near future. We will get to meet the staff and tour the facility. Look for information in upcoming newsletters. 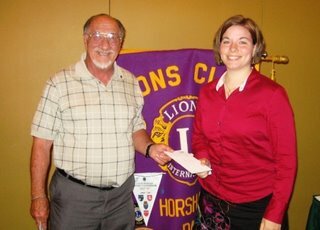 (4) Sunrise of Dresher has expressed interest in starting a new branch club of the Horsham Lions in their location. As you may know, branch clubs are an excellent way to increase membership and keep Lionism strong. In the photo, Sharon, Christen, and Amber are all members of Sunrise's community relations team. Ed is the executive director of Sunrise at Dresher. CapMark (formerly GMAC Commercial Mortgage) has once again donated a significant number of eyeglasses to the Horsham Lions Club. A total of *68* eyeglasses have been donated this time. This brings their grand total to over 150 eyeglasses. Heartfelt thanks go out AGAIN to CapMark for their efforts!